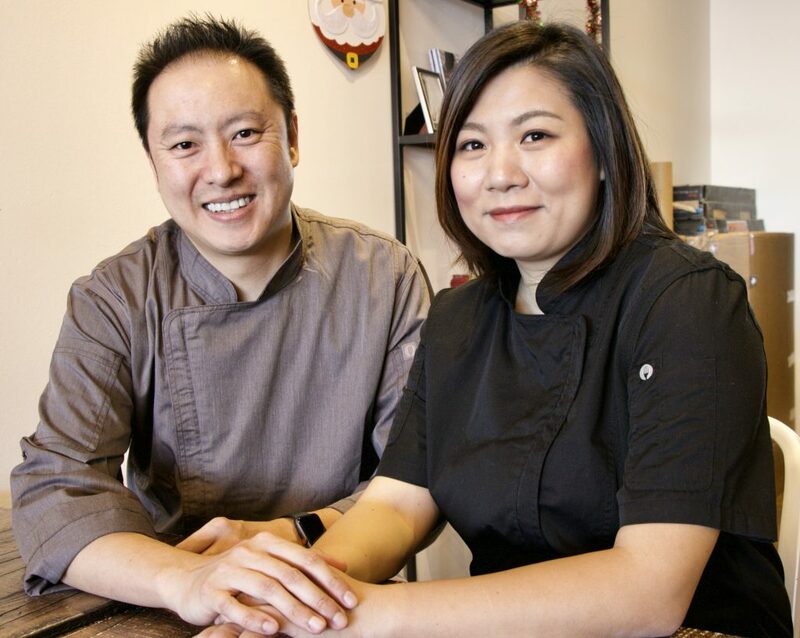 Meet Houston Chocolate Heroes Richard & Rachel Lin of Memorial Bakery — and Try Their Special Pastry! This Mochaccino Mousse Cake is the featured offering for Chocolate Heroes Month at Memorial Bakery. Photo by White Beard Photography. 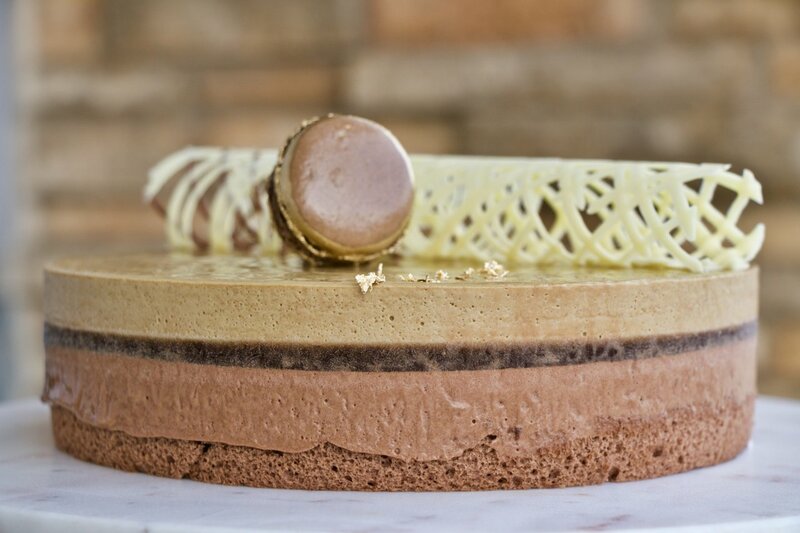 On Saturday, January 26 from 1 to 3 p.m., enjoy a slice of Mochaccino Mousse Cake made with Callebaut chocolate from pastry chefs Richard and Rachel Lin at Memorial Bakery at 9415 Katy Freeway. It’s available for all of Houston Chocolate Hero Month, which runs through February 10. This showcase is sponsored by Callebaut, maker of a wide range of fine chocolates chosen by top pastry chefs around the world for its consistency and high quality. During the January 26 event only, guests can buy one Mochaccino Mousse Cake slice and get one free — so bring a friend! Free samples are available as well. “Memorial Bakery has been around for about 20 years,” says Richard Lin. “We started as a small shop and did mostly wholesale to Houston hospitals and sports venues. About 10 years ago, we decided we needed to concentrate on retail. We relocated to a bigger space so we could host more walk-in customers and provide a sit-down environment and individual desserts.” The Lins specialize in custom cakes and cookies. The Lins place great importance on continuing education. “Rachel trained with famous sugar artist and British chef Nicholas Lodge [of Atlanta-based International Sugar Art Collection], so now she can do realistic figurines,” said Richard Lin. Rachel added that both she and Richard have taken Callebaut’s chocolate classes. In addition, in 2018 they attended the French Pastry School in Chicago. Richard and Rachel Lin make pastries together at Memorial Bakery. Photo by White Beard Photography. On a day-to-day basis, the Lins use Callebaut for their mousse, Tiramisu Cake and for chocolate decorations. For Houston Chocolate Heroes month, they created the special Mochaccino Mousse Cake as well as cake pops featuring Callebaut white chocolate. Memorial Bakery is one of eight independent Houston businesses featured during Houston Chocolate Heroes Month. Click to view all the Houston Chocolate Heroes on a map. Visit any of them to pick up a Houston Chocolate Hero Month Passport and collect a sticker for each of the treats through February 10. Once you’ve collected all eight stickers, use the attached, pre-stamped envelope to mail the passport and receive a FREE Chocolate Heroes apron! It doesn’t matter what you get everything is the best , I’ve tried them all.